Welsh immigrant Jacob Ferguson Humphrey settled here in the 1840s and built a cabin. 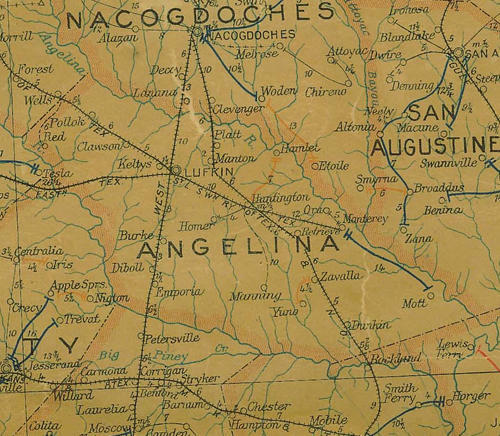 Although there were few mail recipients, the location on the mail route between Alto and Rusk justified a post office. Humphey became postmaster when the office opened in 1854. It closed briefly from Aug of 1860 to November that same year. When it reopened they were in need of a name. The Humphrey family had either grown lonely (or tied of each other) and so they had given a 30-acre tract of land to the recently arrived Hillenkamp family. The Hillenkamps had immigrated from Prussia to avoid mandantory military conscription. Soon there was a store and a "coach station" as well as a store to buy whiskey. Needing a proper name for the post office, they looked around for one and found it right in front of their noses. One of the products sold at the store was Mrs. Hillenkamp's cheese - which had gained some local fame. 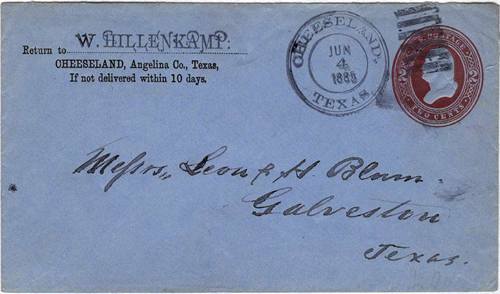 The post office was granted under the name of Cheeseland, Texas in November of 1860. Mr. Hillenkamp took over postmaster duties until Reconstruction removed him from office. Martha Buckalew was the approved postmistress until 1873 when Hillenkamp was reinstated in 1873. In 1886, the post office as well as the store moved to the town of Wells, Texas in neighboring Cherokee County. Although the Humphrey family remained at Cheeseland, the Hillenkamps lost heart and moved away after the post office was moved.